Sopes are a part of the Texas Mexican, Coahuiltecan, cuisine that exists in the region outlined in yellow is one of at least 12 related regional cuisines in the larger geographic area that extends from San Antonio/Austin/Corpus Christi, TX, down to the Yucatán. (1) Our Texas Mexican cuisine is both unique and similar to that of the other regions. The similarities are due to the trade routes, exchange and communication that for centuries were commonplace among the Indians in this southern part of North America. So Texas Mexican is not an exported nor imported cuisine but one that grew naturally in this land over 900 years, its flavor deriving from the flora, fauna and communities that are now partly in Texas and partly in Mexico. (2) Once our European ancestors arrived in the 1500’s, their culinary contributions were simply added to enhance the richness of our food. One example of a dish that is common to all the regions but with delightful variations is the sope, or memela, or cazuelita. This last one, cazuelita, has a unique story of a tradition renewed. 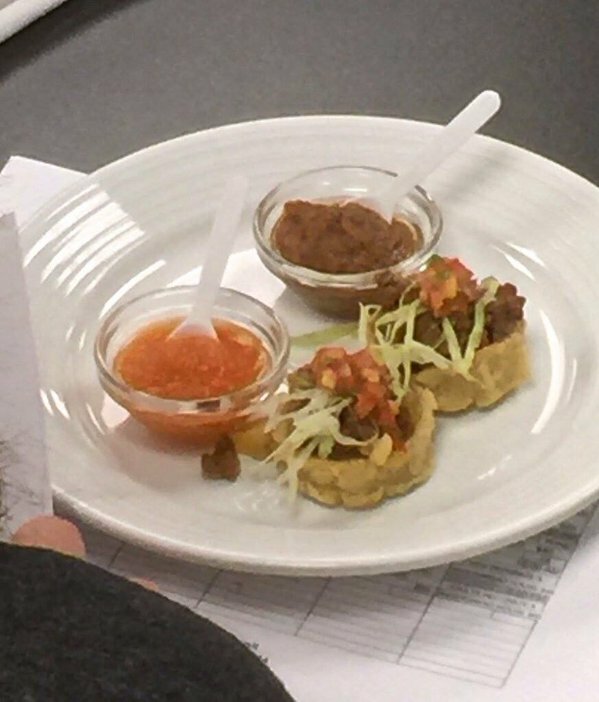 This recipe is adapted from a course taught by Chef Iliana De La Vega, “Classic Cuisines of Mexico,” of the Culinary Institute of America, San Antonio, Texas. For Salsa Mexicana combine the following ingredients in a bowl. 1. Combine the corn flour, salt and water to make a masa. The masa should feel like soft and moist clay. If you need a little more water, add 1 or 2 Tbsp at a time. 2. Cover the masa with a damp cloth and let rest for 30-45 minutes. 3. Roll 20 small masa balls with your hands and press them into thick little tortillas either with your hands or a tortilla press. Keep them covered with a damp towel. 4. Heat a comal or griddle over medium heat and partially cook each little fat tortilla, about 30 seconds each side. 5. Remove from the comal and with your fingers make a fluted rim all around as in the picture above. 7. Heat the Canola oil in a deep fryer or deep skillet to 3500 F and fry the partially cooked sopes until golden brown. Place on paper towels. 8. Fill with the warm refried black beans and top with the Salsa Mexicana and the Añejo cheese. 3. Roll 24 little cylinders resembling flat-ended cigars. Keep them covered with a damp towel. 4. 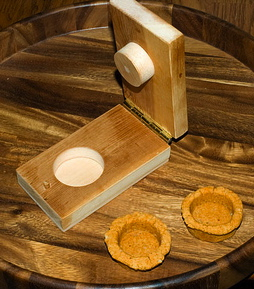 Using a tortilla press lined with plastic of the type that is used as grocery bags, flatten each cylinder, then turn 180 degrees and flatten again into an oval that is 1/8” thick. 5. Heat a comal or griddle over medium heat and partially cook each oval for 1 minute on each side. Note: To get the oval from the tortilla press to the comal you first place it in the palm of your hand, peel back the plastic, then release the oval onto the comal with a rolling motion. 6. Remove from the comal and with your fingers make a fluted rim all around as in the picture above. 7. Heat the Canola oil in a deep fryer or deep skillet to 3500 F and fry the partially cooked memelas until golden brown. Place on paper towels. 8. Fill with the warm refried black beans and top with the Salsa Mexicana and Queso Fresco.7. Fill with the warm refried black beans and top with the Salsa Mexicana and the Añejo cheese. 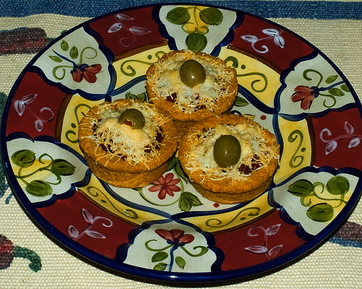 Similar to the Sopes of Mexico City, Cazuelitas were explained to me by Al Canales who commented on one of my blogs. I include them here because they are an example of how our cuisine is always evolving and staying close to family, community, memory. Recipe (makes 20 cazuelitas) Similar to the sopes above except that these are baked, not fried. This is healthier but also a return to our pre-Spanish cuisine when we used little fat because there were no pigs on this land. 4. Roll 18-20 small masa balls with your hands and press them into thick little tortillas either with your hands or a tortilla press. Keep them covered with a damp towel. 5. With your fingers make a high rim all around, fashioning what look like little cooking pots (cazuelas) as in the picture. You can see above how Mr. Canales fashioned a tool for this purpose! 7. 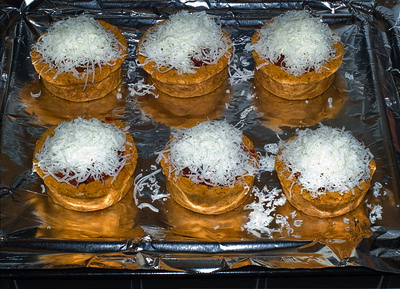 Fill them with picadillo (spiced ground beef), guacamole, Texas brisket or other filling as mentioned above. Whether you cook sopes, memelas or cazuelitas, you are enjoying a long tradition of family, community, memory. ¡Buen provecho! (2) The term TexMex is problematic because its meaning is so contested. It was used for the railroad that linked Texas and Mexico, then later associated with food served in “Mexican” or “Spanish” restaurants that catered mainly to Anglo, non-Texas-Indian clientele. It is also used as a term for Mexican-American persons, many if not most of whom are the descendants of Texas Indians. Coahuiltecan is not an apt term either but that discussion is for another blog. (3) The 3 photos of the cazuelitas courtesy of Al and Lynette Canales. yup, I also find it really intersting to see the back and forth exchanges in this region. Ingredients, recipes, cooking tools. If uyou have interesting recipes for Cuban food, pls share? Adán, this is so interesting! And in the recipé for casuelitas I perked up at the mention of picadillo, which is one of the basic components of Cuban food, and one of the first Cuban specialties I learned how to make. The Coahuiltecan version is different, I’m sure – no raisins or green olives! – but this could be another example of the trade routes carrying this one way or the other across the Gulf and going on from there. Sounds absolutely delicious. Adding the chile to the masa is great! Buen provecho! The other day, being within a couple of miles of my favorite Mexican grocery store, I stopped by and bought some fresh corn masa. The following day, I used Adan’s recipe to make the “casuelitas” and it worked out just like he directed! The only variation I tried (other than the fresh masa) was to add one T. of red chile power (the Mexican type with additional spices). This gave the casuelitas a nice color and great flavor. In the past, I would add cheddar cheese, butter, and other ingredients to the corn flour. But no need to guild the lily, keeping the recipe plain and simple makes the best casuelitas (almost as good as my Tia Elena’s). We filled them with a mixture of beans and chorizo (vinegar cured) and they made a wonderful side dish to our chicken flautas, made with fresh corn tortillas. Life is good!